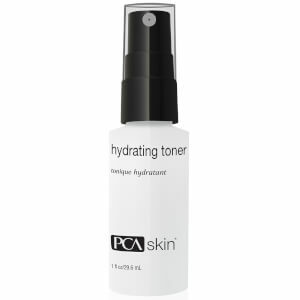 Rejuvenate your complexion with PCA Skin Hydrating Toner; a weightless, daily formula that has been scientifically developed to improve the health and appearance of skin. Infused with Jania Rubens Seaweed, Evening Primrose Oil and Apple Extract, the antioxidant-rich toner sweeps effortlessly over the face to eliminate excess oil and debris, without over-drying or greasy residue. Can be used to refresh and protect throughout the day, or to set makeup in place for extended wear. Skin feels soft, smooth and balanced with long-lasting hydration. After cleansing, moisten a cotton pad with a small amount of toner and apply over the face and neck. Follow with the appropriate PCA SKIN treatment serums and broad spectrum SPF product in the daytime and moisturizer in the evening. Water/Aqua/Eau, Glycerin, Pyrus Malus (Apple) Fruit Extract, Phenoxyethanol, Polysorbate 20, Propanediol, Citrullus Lanatus (Watermelon) Fruit Extract, Lens Esculenta (Lentil) Fruit Extract, Panthenol, Oenothera Biennis (Evening Primrose) Root Extract, Ethylhexylglycerin, Rosmarinus Officinalis (Rosemary) Leaf Oil, Sodium Lactate, Disodium EDTA, Myrothamnus Flabellifolia Leaf/Stem Extract, Sodium PCA, Citric Acid, Sodium Hydroxide, Sodium Carrageenan, Jania Rubens Extract, Ascorbic Acid.